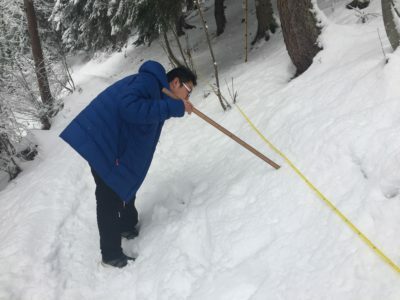 Measuring snow depth in the Beau Reveil Forest. Looking for International Award “service” credit? Do you like camping gear, the outdoors, or science? Then please consider joining the Alpine Institute Volunteers. There are many ways to participate. Sometimes the Alpine Institute needs help with organizing or putting away camping gear. Sometimes we need help with preparing LETS Day and GLOBE Day. Sometimes we’d just like you to do cool stuff that might interest you, like decorating our Alpine Clubroom with posters, adding trip info to the website, creating an “Alpine Journal” to share, making movies, planting native gardens, leading refugees on hikes…. You can pick what interests you and do it on your own time with friends or by yourself. There are times when we need your help right now. For example, drying, sorting, and putting away gear after International Award camping trips and before LETS Day. At other times you can pick the activity and the timing to suit your needs. These require self direction, but adults will support you as needed. Decorate it to look more like a mountain hut, including posters and … you decide. We need to put more information online about local trips and Swiss mountain culture. Learn Weebly or Wix and build a website from scratch. We’ll put the best of it on the Alpine Institute website, too (in WordPress). Have a great idea for something that supports students getting outside? Please let us know!